The law deems contractors to be your worker. Using contractors does not separate your obligations to ensure the work is performed in a safe manner and the workplace is of a safe standard. Recovery Partners provides a range of services to assist organisations demonstrate due diligence and effectively manage contractors safely. Our highly experienced consultants work with a wide range of industries and help employers and workers successfully implement contractor management systems that suit the specific style and needs of an organisation. Develop plans which set out priorities, targets and timelines. Systems include health and safety management policies, health and safety specification clauses, review checklists and KPI's. Need help with contractor management? 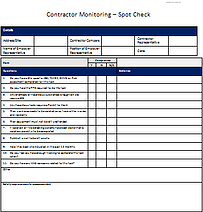 Download our FREE spot check for contractor monitoring.